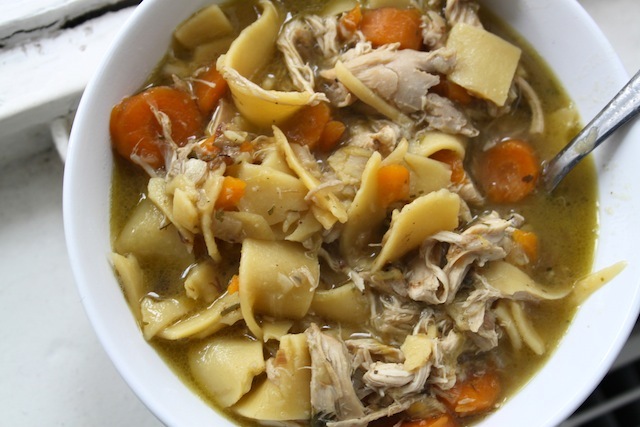 In Sickness: Chicken Noodle Soup – Eat Me. Drink Me. And not just any soup, but the most comforting kind you can imagine – chicken noodle soup. When you are sick, there is nothing nicer than broad egg noodles slumped inside a broth made from the last life-juice of a chicken’s bones. A tinge of garlic, a tingle of ginger – and if you find a bone or two, well, “parts is parts,” as my great grandmother used to say. Nothing cures a head cold faster than chicken noodle soup made from scratch. Old Wives’ medicine or not, a little garlic, ginger, and cracked black pepper is good for the sinuses. Serves 4 generously. Heat about 2 tbsp. of olive oil in the bottom of a large soup pot. Coarsely chop onions, leek and carrots, then sauté in the olive oil until fragrant. Cut your chicken into 6 pieces: 2 legs, 2 wings, breast, and back, and remove the skin (otherwise there’s too much fat in the soup). Add chicken to the pot and lightly brown, then fill the pot with water so that the chicken is just covered. Add a tied bundle of fresh carrot greens and herbs, 2 bouillon cubes (although I use a very light bouillon powder, so you might want to start out with 1 bouillon cube and see how strong your broth is), 1 diced garlic clove, and diced ginger. Slowly bring the water up to a boil, skimming the foam from the surface and discarding. When your soup begins to boil, reduce the heat to low, cover, and allow to simmer for 30 minutes if you’re really sick and desperately need some chicken soup now, and 45 if you’ve got a little more time on your hands. Remove chicken pieces from the pot and separate the meat from the bones. Shred any large pieces of meat (from the breast, most likely) and then discard the bones. Return the shredded meat to the pot. Add salt and freshly ground pepper to taste, then put the lid back on the pot and allow to simmer for another 30 minutes. Just before serving, bring the soup to a rolling boil. Add egg noodles and cook until al dente. Remove pot from heat (or else noodles will turn to mush) and serve immediately. yes, the soup of the gods but for some reason I only like thin wet noodles where as my better half can eat sheets of them in chicken broth…nope, not for me.